The show began around 5:00 in the afternoon when members of the ton would descend on Hyde Park for the fashionable hour. Beautifully turned-out men and women on horseback shared the bridle path with their finely dressed peers who rode in expensive carriages. One did not gallop on Rotten Row during the fashionable hour but instead walked, trotted or cantered along. This gave everyone plenty of time to find out the latest gossip, mingle with influential people and perhaps even engage in a discrete flirtation. Of course being able to show off your riding clothes, equipage and mounts was an added bonus. If you were inclined to stroll or did not have a horse and carriage, you could use the footpath beside Rotten Row and observe the spectacle going on just a few feet away. 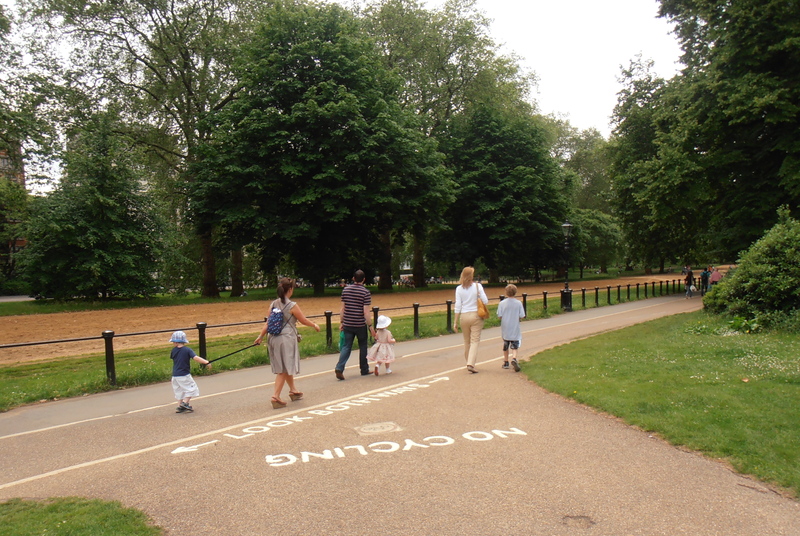 When I was in London last year I spent a beautiful day in Hyde Park and made it a point to take a long walk along Rotten Row. 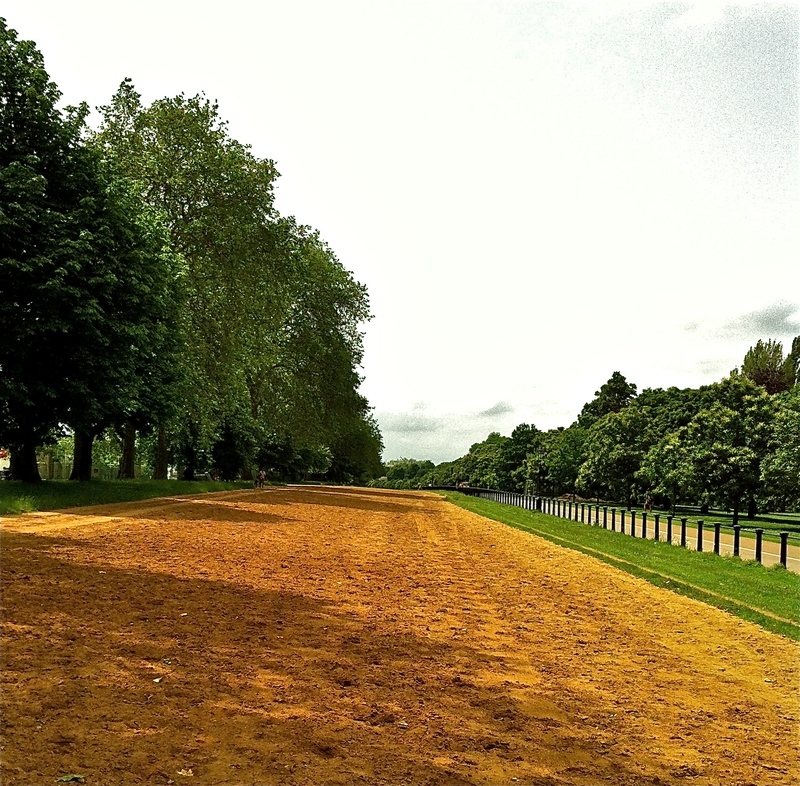 If you’d like to see Rotten Row for yourself, it’s easy to find inside Hyde Park. Enter the park through the Grand Entrance, which is also known as Queen Elizabeth’s Gate. This gate is at Hyde Park Corner next to Apsley House. Just ahead and to your left you’ll see the sand and dirt bridle path which is Rotten Row. Grass and trees border the south-side. To the north, black posts separate the bridle path from a bike lane and footpath. As you stroll along Rotten Row you’ll pass an arbor, flower gardens, green space and eventually you’ll spot the Serpentine to your right. 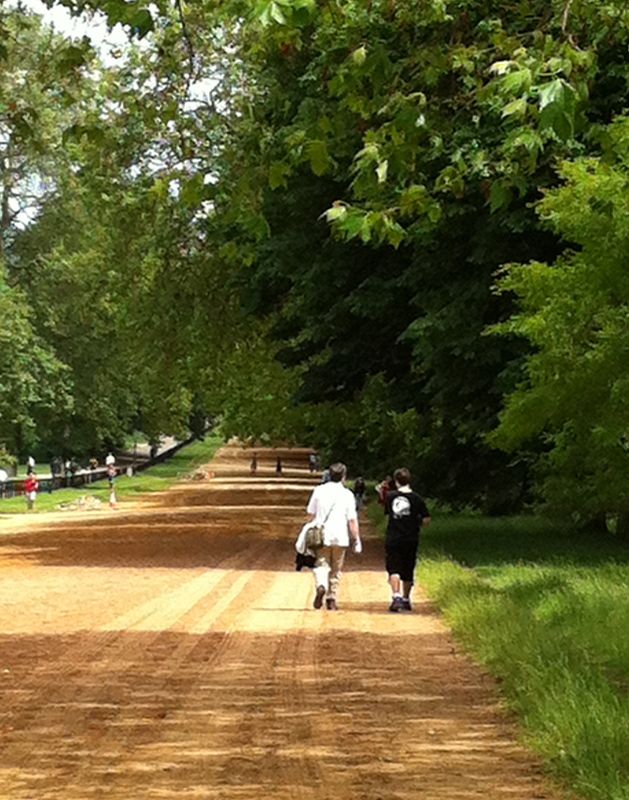 Today you can find walkers and joggers on Rotten Row as well as the Queen’s Household Cavalry. 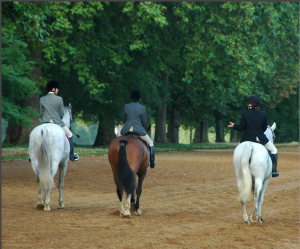 Hyde Park Stables, located inside the park, offers horseback riding as well as lessons if you’d like to ride on this path yourself. So why would such a fashionable place have such an odd name? One of the most popular explanations is that the path was called “Route du Roi,” which is French for King’s Road. Eventually the French was corrupted by the English to Rotten Row. Although this explanation makes sense, I still find it a funny name for such a prestigious place. Laurie Benson has the scoop on Rotten Row, where the Regency elite strutted their stuff.